Made by Meadowbank Manufacturing Co. in Meadowbank, New South Wales, 1909. The O-class tram has a combination of enclosed and open sections. In the centre are the four closed sections accessible to the street via sliding doors and fitted with cross bench timber seats. On either side of these are the two open compartments, each fitted with two facing cross bench seats with metal armrests. These two sections have pull-down canvas blinds to protect passengers against the elements. Enclosed driver's compartments at each end are joined to the open compartments. Since all the seats on the O-class trams are transverse or crossbench this gave rise to the pet name of "toastrack" trams, referring to the pattern of equally spaced vertical divisions between the bench seats. Around the exterior of the tram is a timber conductor's footboard where the conductor walked to collect fares in all weathers.The tram is driven by 4 motors, two each in the two trucks in which the running wheels are housed (Sydney No.2 trucks, 4-ft (1.22m) wheelbase). During the first decade of the twentieth century, the Sydney tramways produced a variety of electric tramcar designs, none of which proved entirely satisfactory. From 1901, when the established steam tram policy of crossbench seating was revived, electric cars were built of both open and closed types with capacities of 50, 60, and 70 passengers. However, none of these was built in large numbers other than the hybrid E class, of which 202 were built. In April 1908 the prototype of the O-class electric car, Sydney's most famous tram design, rolled out of the Randwick Tramway Workshops. Numbered 806, the tram was capable of seating 80 passengers in a combination of open and enclosed accommodation. This design was an immediate success. Technically, the O-class trams were the most advanced in Australia, with the adoption of four traction motors in two equal-wheeled bogies with multiple unit control. Mechanically they were simple and trouble free in operation and were always popular with passengers and crew alike. The prototype O-class tram, Car No. 806, went into service on 8 March 1908, with adjustments completed in April 1908. It was attached to Waverely depot and worked from Coogee to Circular Quay. On 30 August 1908 the tram was sent to the Meadowbank Manufacturing Co., at Meadowbank, (Sydney) as a sample for the first production batch of cars Nos 807 to 818 which were delivered in time for Sydney's Christmas-New Year holiday traffic of 1908-1909. The Meadowbank Manufacturing Co. constructed all the cars in the class. These were undertaken in batches from 1908 until 1914, Nos 803 to 805, 807 to 873 (70 cars); Nos 874 to 897 (24 cars); Nos 898 to 947 (50 cars); Nos 949 to 998 (50 cars); No.999 (1 car); Nos 1000 to 1129 (130 cars); Nos 1130 to 1279 (150 cars); and Nos 1330 to1479 (150 cars). A total of 626 cars were in the fleet, making the Sydney 0-class trams numerically the largest class of tramcar in the world. The last O-class car, No.1479, entered service on 26 September 1914. On 9 March 1914 Tramway Traffic Superintendent Kneeshaw and Electrical Engineer Brain suggested a further 50 non-coupling O-class cars be built for the perceived tramway needs after June 1915. These would have been Nos 1480 to 1529. However, Kneeshaw's death, only 6 days later, and the onset of World War I prevented any more route expansions or the increase of rolling stock. The Museum's O-class electric, tram No. 805, was built in 1909 and given the vacant K class number of 805. The O-class tramcars were launched in Sydney in 1908 with great fanfare and were referred to as "Dreadnoughts", a name used for everything modern at that time. With their 33-inch diameter wheels, the "toastracks" were the fastest trams of the day. They were especially suited to venues such as race meetings, sporting matches and the Royal Easter show as they could be emptied and filled quickly by means of the numerous doorways. They carried Sydneysiders everywhere: to the beach, the zoo, the cricket, to the football and to work. Ladies would generally sit in the enclosed compartments, while gentlemen sat in the open compartments braving the elements. The O-class tramcars were the backbone of the Sydney fleet for 40 years and saw service on all the Sydney electrified lines at various periods. Recollections of travel on the O-class trams in Manly during the 1920s were compiled by Robert Makim in his article "All aboard the last Manly rattler". Some are quoted below. "The tram guards were a race apart apart and were generally much admired by little boys, even though we did our best to outwit them by 'scaling' a ride, crouching unseen on the footboard on the other side of the tram. They [the conductors] had a marvellously free-flowing style of walking the footboards. By using vertical brass handrails, they would sweep majestically from one end of the tram to the other with a graceful sideways step not unlike a ballroom dancer. They were outside in all kinds of weather, and in heavy rain would be swathed in voluminous black oilskins. Their leather money bag with its ticket clipboard never seemed to get wet, as they would open the doors, lean inside with their bag, brace themselves with their elbows and knees, announce 'Fares 'ease', and then perform the complicated task of thumbing off the correct tickets, taking money and counting change, all the while balancing on the footboard as the tram swayed along the tracks." "Also, at the terminus, theirs was the exciting job of pulling down the operating pole, thus silencing the motor, then bringing the motor panting back to life again by fitting the other pole onto the overhead wire with a most satisfying shower of sparks." Sydney's tramway system developed into the largest in the British Commonwealth outside of London and supplied transport to the growing suburbs. At its peak in 1922 some 1,600 trams were used. The controversial decision to phase out trams altogether in favour of government buses was made as early as 1938. The O-class tram numbers dwindled from 1953 onwards, until the class was totally removed from the Sydney system with the closure of the George Street line in 1958. The once great tramway system was defeated by the high cost of maintaining track, servicing the aged and rundown O-class trams, and the increased use of the private car, which saw commuters desert the public transport system in droves. Furthermore, the trams were blamed for the increased traffic congestion in the city. The last tram to operate in Sydney ran from La Perouse to Maroubra on Saturday 25 February 1961. The Museum's O-class electric tram No. 805 was built in Sydney in 1909, the first contract batch of O-class trams built by the Meadowbank Manufacturing Co. of Meadowbank, NSW. It was placed in service on 4 August 1909, and operated on the route from Manly Wharf to Narrabeen, at North Sydney, at Ashfield. and for a brief period in the Rockdale district. 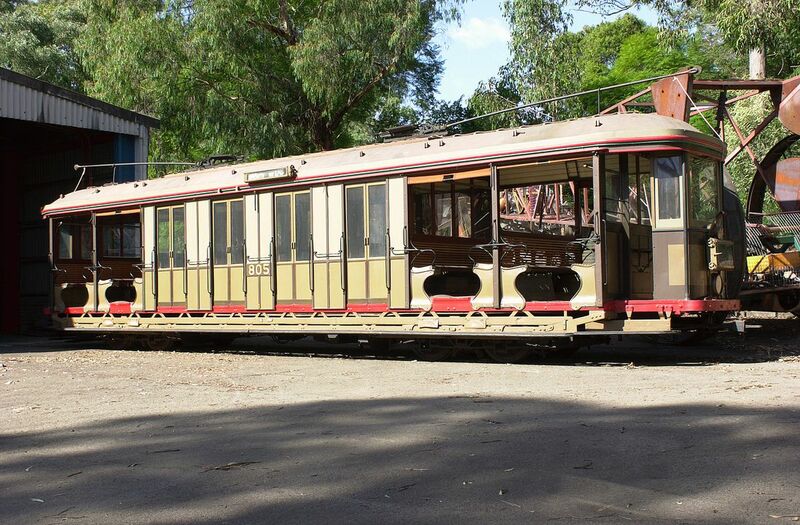 The tram was restored at the Randwick Tramway workshops under Mr Hastie and presented to the Museum in 1961. Only six of the 626 O-class trams have been preserved. Four of these are at the Sydney Tramway Museum, Loftus - Nos 957, 1111, 1030 (14S) and 1089 as an OP class - while No. 1187 is owned by the Oregon Electric Railway Society, USA. The O-class tram No. 805 was owned and operated by the New South Wales Government Tramways. In 1961 it was presented to the Museum.